Tylosin is a macrolide antibiotic and has a bacteriostatic action against Gram-positive and Gram-negative cocci. After oral administration, therapeutic blood levels are reached within 2 – 4 hours. 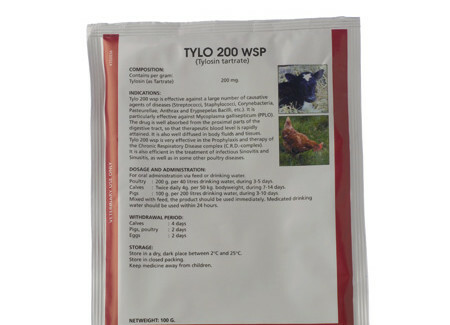 Tylo 200 wsp is effective against a large number of causative agents of diseases (Streptococci, Staphylococci, Corynebacteria, Pasteurellae, Anthrax and Erysipelothrix rhusiopathiae, etc.). It is particularly effective against Mycoplasma gallisepticum (PPLO). The drug is well absorbed from the proximal parts of the digestive tract, so that therapeutic blood level is rapidly attained. It is also well diffused in body fluids and tissues. 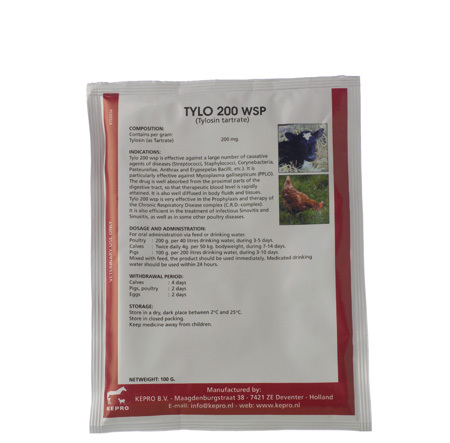 Tylo 200 wsp is very effective in the prophylaxis and therapy of Chronic Respiratory Disease (CRD) in poultry. It is also efficient in the treatment of infectious synovitis and sinusitis, as well as in several other poultry diseases. Calves : 4 g per 50 kg bodyweight twice daily, during 7 – 14 days. Pigs : 125 g per 100 litres of drinking water during 7 – 10 days. Poultry : 250 g per 100 litres of drinking water during 3 – 5 days.